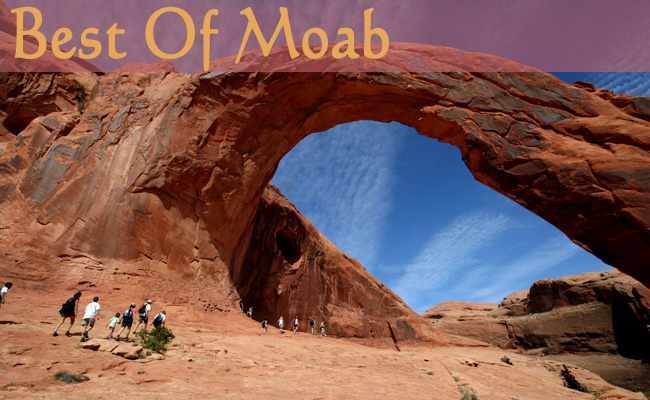 The Best of Moab Moab’s variety of attractions and activities draws visitors from around the globe. Indeed, the area lays claim to unequalled outdoor recreation in and around national and state parks. Here we have compiled a best of list of restaurants, town hikes, shopping opportunities and family activities in the Moab area. We hope this will help make your Moab vacation as FUN as possible. Spectacular Fine Art Prints of landscapes, nature, history, and travel subjects worldwide. Utah’s largest selection of Native American and southwestern art. Fabulous yarns and natural fibers for knitters, spinners, weavers, and Friendly atmosphere, and helpful staff. All sorts of rocks and fossils for sale. The Scott M. Matheson Wetlands Preserve is an oasis in the desert. This lush preserve is a stark contrast to the surrounding redrock cliffs and arid desert. To this oasis flock over 200 species of birds, amphibians, including the northern leopard frog, and aquatic mammals such as the beaver, muskrat and elusive river otter. Directions: Travel south on State Highway 191 (Main Street) Turn west onto Kane Creek Boulevard, located between McDonalds and Burger King. Travel 3/4 of mile to the Y in the road. Bear leftand travel 1/2 mile to the preserve entrance. Short and easy hike of about a mile long with a spring water fall at the end. The primary components of this 24,000 sq ft facility include: indoor 6-lane competition pool with 1m and 3m diving boards, plus shallow-water area and slide; outdoor lap pool with adjoining current channel; large outdoor leisure pool with zero-entry depth and play structure with slide. Great shaded path that stretches from one end of town to the other. One of Moab’s most popular hikes flows a spring fed stream and heads in a natural bridge. This trail is about 3 miles round trip and starts along beautiful Hwy 128. Offers great views of the Moab valley.